The Thos. 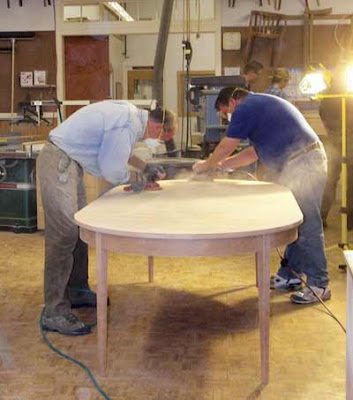 Moser company makes exquisite furniture by hand. I've written about them repeatedly in the past and the more I see fine furniture, the more convinced I am that my lede sentence is as true a sentence as I can compose. If it's possible for furniture to be lyrical, Moser's is that and more. 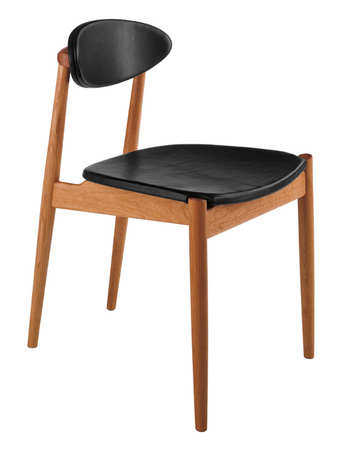 Moser's offerings aren't just pretty and poetic, they're the perfect marriage of form and function. Joinery is ornament; the promise of comfort and longevity whisper in the background. 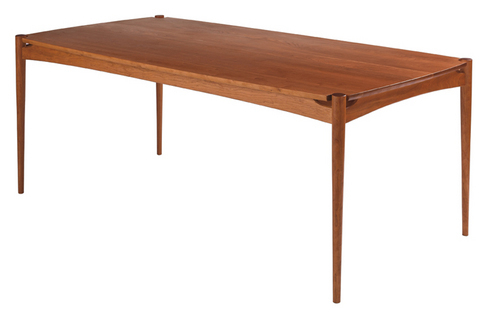 If it's possible for furniture to achieve timelessness, this furniture does. The people who appreciate fine woodworking tend to be fanatical about the creations that pour out of the Moser workshop in Maine. Thomas Moser's cabinetmakers still do things the hard way and the results speak for themselves. Ever since 2007, the Tomas Moser company has offered a program for its buyers that sounds like an armchair woodworkers fantasy come true. Meet the Thos. Moser Customer in Residence program. The Customer in Residence program they offer is a one-week apprenticeship in the Moser workshop during which fine furniture customers can work alongside a master cabinetmaker. These lucky customers will build the heirloom that will some day grace their homes. I'm solid in my belief that everything someone owns should tell a story. Now just imagine having a group of friends over for dinner and while everyone's sitting and enjoying a meal, starting a story that begins with "I helped to build this table during a week I spent in Maine..."
Thomas Moser offers the Customer in Residence program eight times per year and they've been conducting these working vacations since 2007. For people who can't take a whole week, there are now weekend programs available too. Space is limited as I'm sure you can imagine and while working on an eventual heirloom, "apprentices" stay in the nearby Harraseeket Inn in Freeport, ME. Fine dinners every night allow participants to get to know the Moser family and the week wraps up with a signing ceremony. During that ceremony, the piece a participant helped create gets signed by the participant, the master cabinetmaker and Thomas Moser himself. Talk about furniture with a story to tell after all that. My head spins at the very idea. You can find more information about Moser's Customer in Residence programs on the Thos. Moser website. There's contact information there too in case you're interested in attending or if you'd like more details about the program. If you'd like to read a first hand account, a writer named Dawn Klinginsmith wrote about her Customer in Residence experience for the Chicago Tribune last year. It's easy to fall into the belief that craftsmanship is dead and Thomas Moser's Customer in Residence program proves yet again that it isn't. Hmmm. Mosaic inlays in an exquisite table perhaps? That would be such an educational and amazing experience! Thanks for sharing!